Yesterday afternoon a pretty freakish storm descended on Florence that made national news: heavy rain with hail about 2 cm wide carpeted most of Florence making it seem like snow had fallen. The hail cause quite a bit of damage while the wind and rain cause many trees to fall. At least no one was majorly hurt. 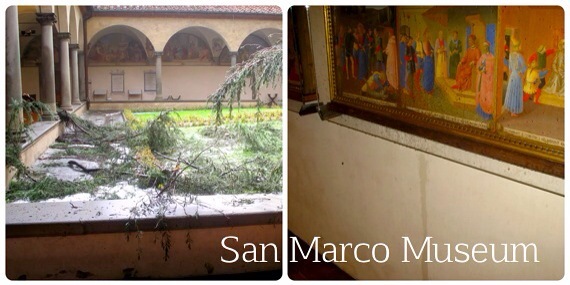 Most museums closed temporarily to access damage, as windows were broken by the hail and water came into buildings where priceless works of art are on display. Some did get wet. 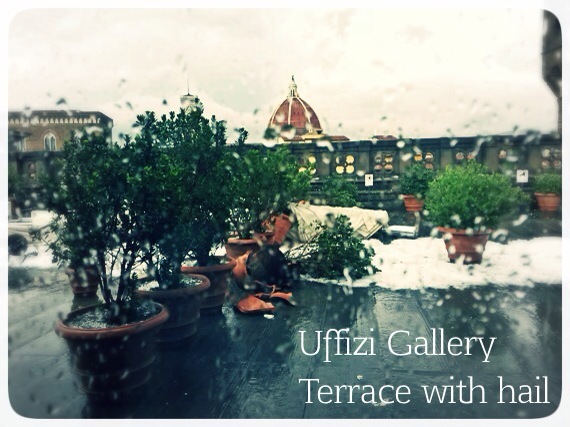 Closures included the Uffizi Gallery, the Academia Gallery and the Pitti Palace. After a few hours, the Uffizi and Accademia were reopened but this post is actually about those where heavier damage means longer closures. Among these are the Boboli Gardens, parts of Palazzo Pitti, the San Marco museum and parts of the Palazzo Davanzati museum. 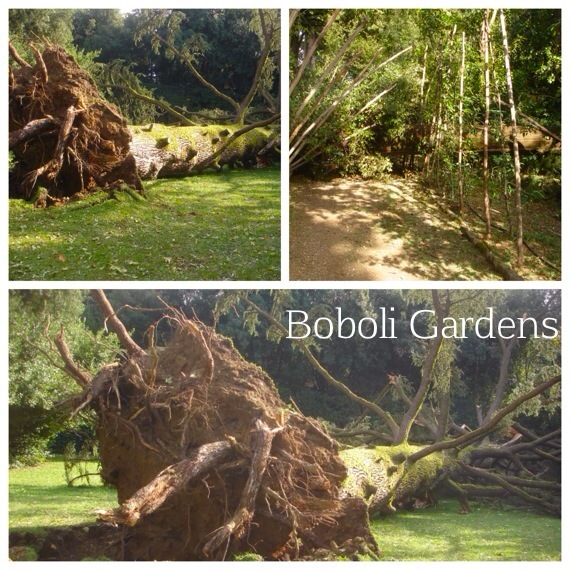 The gardens will likely remain closed for this coming up week while fallen trees are cut and cleared away. 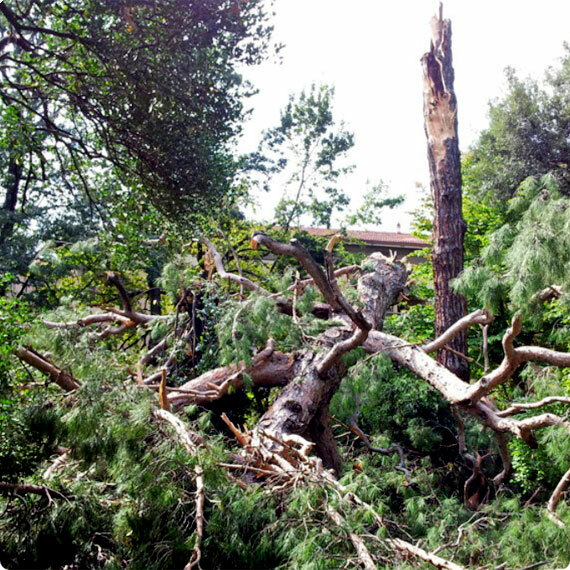 These includes a Lebanon cedar, several cypresses and many fallen/broken branches from the fury of the wind. Maintenance also needs to be done on underground water pipes and the stone walkways where wind and water swept away everything. Today, broken windows along the main facade have already been replaced and repaired so entry through the main doorway has been re-established. However, parts of the Costume Gallery where water infiltrated and caused damage will remain closed for now. The museum remained closed today and will be closed over the next few days. The secular cedar in the main courtyard suffered damage and will therefore need to be cut down. it is however safe for now. Four painted wooden panels got wet from broken windows, the staff is already working on accessing and repairing any damage. The museum should reopen by Wednesday September 24th. The museum reopened today but the room with lacework called “merletti” suffered a lot of damage. The collection of lace items, samplers and clothing got wet but staff already accessed the situation and moved all items to other parts of the museum. Several paintings also got wet, but these have also already received the first interventions to make sure damage is limited. All of the other State museums in Florence are open following their normal hours, and visitors today were able to enjoy the later opening hours as part of European Heritage days with entry at just 1 euro. More bad news from Florence’s Botanical Garden, one of the oldest in the world, along with those in Pisa and Padova. Many trees and plants have been in the garden since the 1500s and thus part of our history… and the wind, rain and hail from last Friday – some parts of Florence actually were touched by a tornado – damaged, uprooted and broke many of them. Damage has been quantified in over half a million euros in damage, but more importantly, over 80% of the trees are damaged. While there have been floods and cold freezes in the course of centuries, this was truly an extraordinary event. Both the rain and wind were so strong that the plants were damaged irrepairably, many breaking or completely being uprooted and falling over. Even those already in the historical greenhouses, which were also damaged, were not untouched. Estimates are that it will take 3-4 months before the garden can be reopened :(.